Will Obama become Russia's disappointment of the century during his visit to Moscow? US President Barack Obama is coming to Moscow on July 6-8. 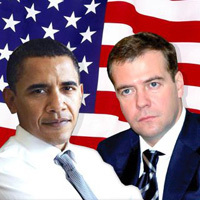 The world expects that Obama and Medvedev will achieve significant progress in signing the new Strategic Arms Reduction Treaty. However, Russia will also raise the question of the new Missile Defense Treaty. Dmitry Medvedev said on June 20 that Russia was ready to cut its strategic offensive arms several times. However, it will happen only if the United States takes efforts to relieve Russia of its concerns about the deployment of the US missile defense system near Russian borders in Poland and in the Czech Republic. US State Department spokesman Ian Kelly said on June 24 that the US administration would be ready to discuss the two treaties only separately. Kelly welcomed Russia’s readiness to cut the nuclear arsenals and said that the decision to deploy ten interceptor missiles in Poland and a powerful radar station in the Czech Republic had not been made. Therefore, Russia and the United States still have considerable discrepancies. Russia is not going to take the missile defense issue off the table because the solution of this problem is closely connected with the national security of the country. It is worthy of note that the course of negotiations regarding the issue does not depend on Russia and the United States alone. Poland and the Czech Republic are USA’s NATO allies, so Washington will not be able to push them away from the talks. James Collins, the former US Ambassador to Russia in 1997-2001, the Director of the Russia and Eurasia Program at the Carnegie Endowment for International Peace, told Pravda.Ru that Washington would conduct talks with Warsaw and Prague regarding the issue. “When discussing the missile defense issue, Obama will consult Poland and the Czech Republic. He will take their points of view into consideration. The USA will have to take account of the interests of other European countries too,” Collins said. “At the same time, the interests of Poland and Czechia do not cancel the fact that the US-Russian dialogue about the missile defense system has started. I would like to repeat here that one will have to take account of the interests of all nations involved in the process,” he said. What interests do Poland and the Czech Republic have? “Russia does not face a military threat, but it sees a threat to its politics of a superpower. We do not want to become a part of the sphere of Russia’s influence again. If Europe does not support the US missile defense project, the continent will be jeopardized,” Czech Prime Minister Miroslav Topolanek said in May of 2007 explaining the need to deploy the elements of the US missile system in his country. The Czech Parliament dismissed Topolanek in March of this year. His lobby of the deployment of the US radar station in the Czech Republic played an important role in the decision to sack him. Many opinion polls showed that up to 70 percent of the Czechs stood strongly against the US missile defense project in their country. The project does not find enough support with the majority of the Czech deputies either. Which point of view will Obama take into consideration during his meeting with Russian President Medvedev? Will it be the point of view of the former prime minister or the opinion of the Czech nation in general? Let’s proceed to Poland. Former Prime Minister of Poland Jaroslav Kacznski stated in February of 2007 that the Russians were hoping to have Poland back in their sphere of influence. “Once we have the US missile defense system deployed in Poland, the chances for that will reduce considerably for at least several decades,” he said. Kacznski added that the missile defense system in Poland was not going to be aimed against Russia. Poland’s Foreign Minister Radoslaw Sikorski said in an interview with the Wyborcza newspaper on June 24, 2009, that Poland asked the United States to deploy both the elements of the missile defense system and a battery with 196 Patriot missiles in the country. “Its presence on our territory must be a confirmation of the union between Poland and the USA. I hope that various speculations will not make the battery become a symbol of Poland’s disappointed expectations,” Sikorski said. His statements sound like extortion. No one at the Polish administration rejected Jaroslav Kacznski’s point of view either. If Obama pays attention to such remarks of his allies, the US-Russian dialogue on missile defense will come to a full stop.